In this article we shall examine the massive and deadly SA – 5/S200 SAM system NATO reporting name “Gammon”. 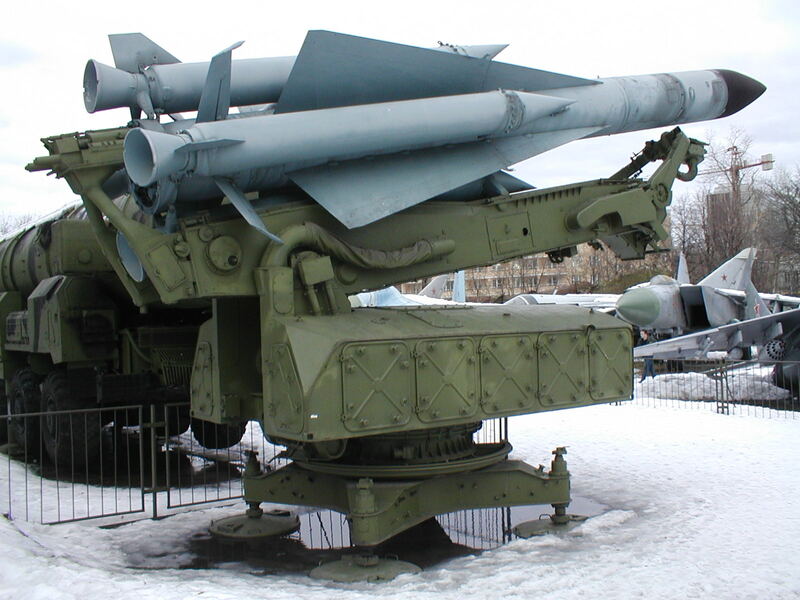 The NPO Almaz S-200 Angara/Vega/Dubna (Russian Ангара\Вега\Дубна), NATO reporting name SA-5 Gammon, is a very long range, medium-to-high altitude surface-to-air missile (SAM) system designed in the 1960s to defend large areas from bomber attack or other strategic aircraft.The S-200 surface-to-air missile system was designed for the defense of the most important administrative, industrial and military installations from all types of air attack. S-200 provides defeat of modern and advanced aircraft, including air command and control centers, AWACS aircraft, aircraft jamming creation and other manned and unmanned aerial vehicles. The S-200 is an all-weather system that can be operated in various climatic conditions (Aside from this the author could find little relevant developmental history and will improve the article if any info). Each missile is launched by 4 solid-fueled strap-on rocket boosters. After they burn out and drop away (between 3 and 5.1 seconds from launch) it fires a 5D67 liquid fueled sustainer rocket engine (for 51–150 seconds). This accelerates the missile from 0 to mach 8 during burn time. Maximum range is between 150 km (81 nmi) and 300 km (160 nmi), depending on the model. Effective altitude is 300 m (980 ft) to 20,000 m (66,000 ft) for early models and up to 35,000 m (115,000 ft) for later models. The fire control radar of the S-200 system is the 5N62 (NATO: Square Pair) CW H band radar, which has a range of 270 km (170 mi). It is used for both the tracking of targets and their illumination. In BMS an additional radar system is included in an SA – 5 site, the Bar Lock B is a early warning and search/tracking radar this should also have to be destroyed to render the site ineffective. Defeating the SA – 5 is a similar process to defeating an SA- 2/SA – 4. The only difference being that because of its massive range your are very unlikely to see the missile that’s coming for you. Luckily the SA – 5 is a very easy missile to defeat. When the SA – 5 launches at you you have two courses of action. One action you could take is to over G the missiles tracking solution, one executes this simply by turning into the missile as it guides into your path at close range (kinetic defeat). The other is to defeat the missile using counter measures, both these methods work well but a combination of both is best advised. The SA – 5 is used as the main long range SAM in the KTO and is highly effective at preventing support and deep strike sorties that are enacted by large aircraft such as F111 and B52s. In order for these packages to be successful the SA – 5 sites must be destroyed… luckily these sights are rare in korea. The SA 5 also features in the Syrian air defense and poses a significant threat to larger aircraft flying from the ITO!